As a 7th grade Science teacher, I am always exploring my options for professional development that meet my needs professionally and personally. I have attended many varieties of professional development through my years of teaching; some of it has been done exceptionally well, and some of it has been rather disappointing. Key Issues Institute at Keystone Science School was a professional development opportunity that I would deem exceptional. I spent July 14th- 19th at Keystone resort, and connected with approximately 40 other educators from various locations around the world. This opportunity was available to me because of the sponsorship of Avout, and I wanted to share with you some of the experiences I had. The primary focus of Key Issues Institute is to help teachers understand and implement lessons that limit bias, whether it is personal or from certain stakeholders. We were encouraged to understand the need to look at issues from multiple perspectives so that we may gain greater empathy to the opinions of others. As a science teacher, I feel that science content can create great opportunities for discussion, yet I have been hesitant to allow for controversial topics because of the possible repercussions such discussions might allow, especially from parents. It takes great care and thought to navigate discussions on what some might call controversial topics. One of my take-aways from the Key Issues Institute was embracing the topics that might encourage disagreements with students in ways that are respectful, thoughtful, and provoke meaningful dialogue. To do this we need to look at the stakeholders and where their passions lie. One of the valuable pieces of this experience was the knowledge of the facilitators who led the lessons and activities. They all had experience in the classroom and understood the challenges that we as teachers have in dealing with the variety of personalities, learning styles, and abilities of our students. They offered tangible suggestions on how we could adapt lessons to meet the different needs we might encounter in our own classrooms. I would also like to share an activity that was one of my favorites, because it had elements of STEM incorporated into it. The lesson was called, “Community Development and Sustainable Design,” and it involved the design and building of a tram to transport residents and tourists from a fictional town called Silver City to another area in Summit County. In small groups we had to design, build, and test run a tram that met 3 criteria: Economic, Environment, and Social equity. This was a valuable lesson in seeing how businesses have to navigate so many factors in order to accomplish a goal, something I myself hadn’t thought much about as a science teacher. In our small groups we had various roles such as “Regulation Compliance Specialist” and “Purchasing Agent.” We had to meet a time deadline, and adhere to strict safety, aesthetic, and waste clean-up guidelines as we progressed through the lesson. We earned points for successfully meeting the different criteria, and this motivated us to compete against surrounding groups to develop the best design. Our final test was making sure that our model actually worked by testing it on a string that is a model for a tram cable. 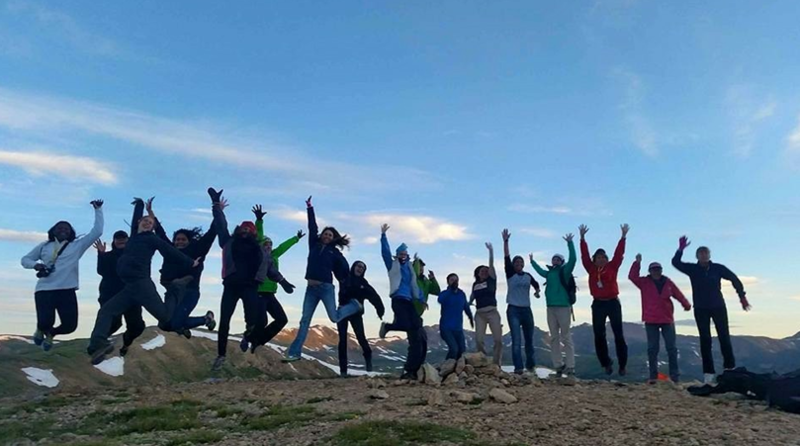 The lessons we learned throughout this activity not only included science, but economics, math (accounting), time management, environmental impacts, social equity, and business skills. I can see implementing this with my students as a cross-curriculum lesson between the Math, Language Arts, and Social Studies teachers and their classes. The last thing I would like to share about Key Issues Institute is the opportunity we had to do field work like scientists have to in order to share data. We had to test the water in three different locations to check for physical tests such as velocity, width and depth, biological diversity, dissolved oxygen content, zinc content, pH, and temperature. This data was analyzed for the overall water quality. I can see using this with middle school students to understand how to collect and analyze data. This has provided a snapshot view of the content we learned at Key Issues Institute. The social and professional value is ongoing. I have met some amazing people from coast to coast that all share a love of learning and educating. We enjoyed some amazing moments hiking to the Continental Divide, riding a gondola, and fellowship together during meals. Add this to the content learned and I feel like I was very fortunate to participate in such an amazing experience!